Data-driven instruction is the mantra in today’s educational landscape. Programs must find ways to effectively assess, analyze, and act to improve curricular and instructional practices. Although the need for evaluation processes is well-documented, developing the systems by which to review and assess teaching and learning is challenging for most educational programs. 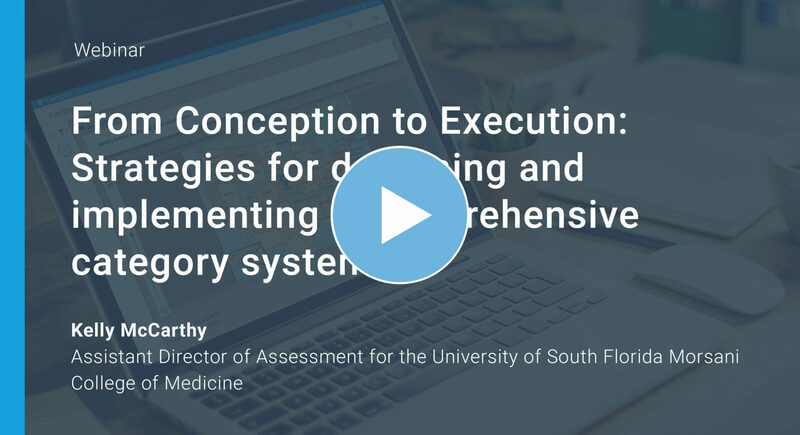 In this webinar, we will discuss how a team of medical and biomedical faculty and staff developed an assessment monitoring system utilizing the category tool within ExamSoft’s assessment software. Presentation of critical outcomes will include: (1) the system design and implementation plan- including faculty recruitment and the roles and responsibilities of those involved with the project, (2) the development of targeted reporting – both for university leadership and students, and (3) how results from the project were used to improve discipline- and organ system-specific curriculum initiatives within the college. While the information in this presentation focuses on a medical education context, the material presented could be modified and used in a variety of educational disciplines. When designing a category system, choose team members who will be intimately involved in the testing process, and make sure to pick categories that are relevant to your program. Before final implementation of your category system, solidify all process logistics by thinking about the entire process from start to finish, who will be involved, timeframes for completion, and checking the entire process for accuracy. Data from category reports are helpful for designing remediation plans for struggling students, gauging balance and coverage of topics in a specific course, and for evaluating overlaps and gaps in curricula.